As we exited the airport we were struck by the greenery and pretty shrubs which surrounded the path to the nearby car hire centre. On the path we passed an inviting-looking cafe with a covered terrace which almost tempted us to stop before even getting our car. Ignoring the instructions and the satnav, we found our own way to our hotel along quiet back roads with little traffic, and the occasional beautiful view of the sea and beaches below us. The scenery was typically Mediterranean, dry-looking fields with grey and green mountains beyond, but with a unique ambience which we have not experienced elsewhere. 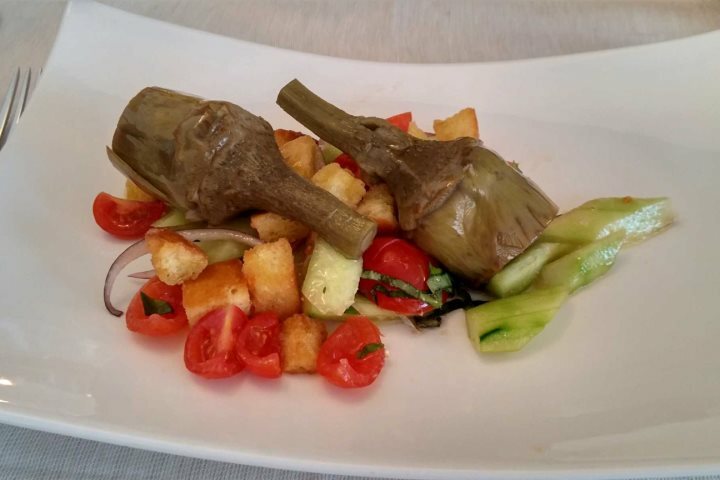 When we arrived at our base for the week, Hotel Gabbiano Azzurro, we immediately felt at home and the staff were friendly and made us very welcome. The fragrance of some impressive-looking orchids in the main reception area was a nice touch, complemented by the lovely scent of Jasmine on the pool terrace. Our room was spacious and clean, with superb views along the beach and over the bay. A small beach bar beckoned, so we strolled along the soft white sand to grab a local Ichnusa beer and some snacks. Dinner that evening was four courses of delightful food; veal, squid, soup, artichoke, fish, crème brûlée & cheesecake were our choices. After a much enjoyed breakfast of meats, cheeses, yoghurt and fruit on the terrace, we drove to San Pantaleo for the Thursday village market. The road passed through some unusual landscapes of granite outcrops eroded into sculpted shapes. Once we reached San Panteleo, we explored the small, but vibrant market, with arts and crafts, clothing and local produce all on display. We purchased some painted pottery garden ornaments, and then we sat outside a small bar on the piazza for coffees and people-watching. 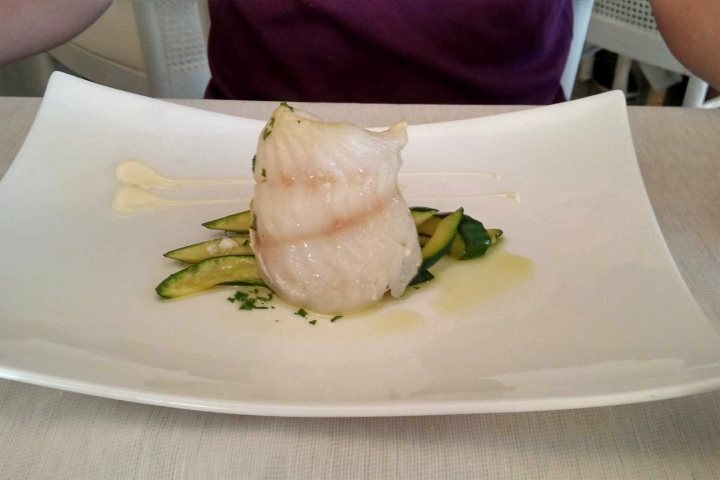 When we returned to the hotel, we found a complimentary bottle of Prosecco on ice waiting for us, followed by an a la carte dinner on the terrace with sea bream main course. Massimo, the head waiter was especially gracious and very entertaining. Above: the à la carte restaurant at the hotel. 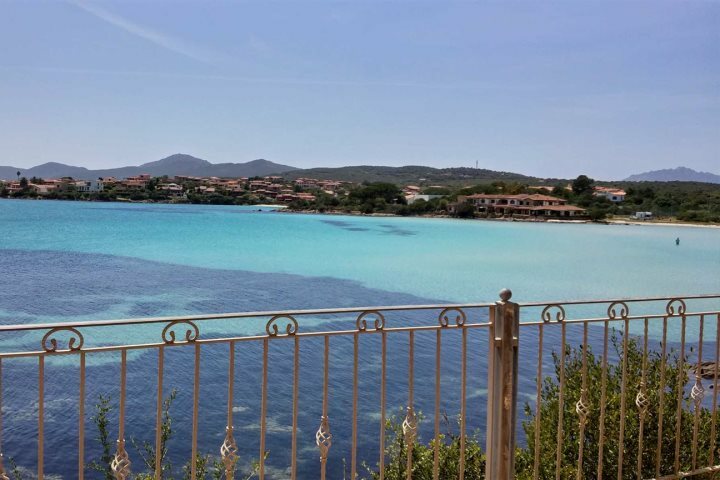 On day three, we drove to Porto Cervo along some of the bendiest roads I have seen (which would do credit to the Alps), but well-kept and quiet. 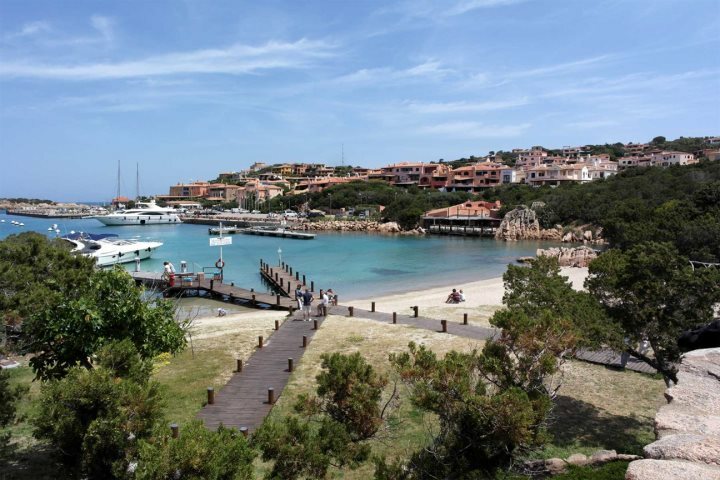 Porto Cervo made us think of Bedrock from the Flintstones with the terracotta and pale yellow buildings looking like they were carved out of Stone Age rock. The shops were quite the opposite; a thoroughly modern mix of high end designer outlets with security guards to let you in. The whole thing is set around a harbour of dazzling blue sea with millionaire-only boats. The setting and the unique style of the buildings gave a new photo opportunity at every corner. 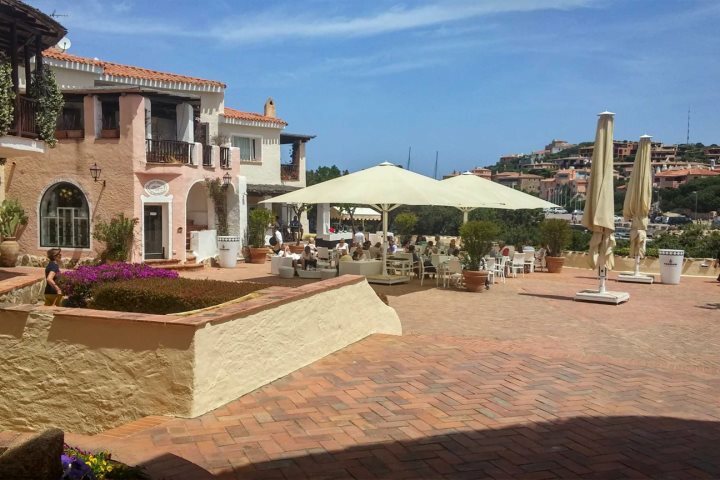 Before leaving Porto Cervo, we stopped for a pizza at Reef Café. The pizza was good, but the highlight was their beautiful cakes, including "Pesta"; traditional cakes which were also loaded with alcohol! We headed inland to visit the “town of cork” – Tempio, where we found a bustling market set in a maze of cobbled streets. En-route we saw the cork trees with their bark stripped away, which made them look like their clothes didn’t fit. We found a delightful bar café called El Gardino which was like a garden under cover, where we had antipasti of local meats and cheeses and spaghetti carbonara. Leaving Tempio behind, we followed the road to Lagos del Coghinas - a large lake where we expected to find lakeside beauty spots and some great views. We found the views but the lake is undeveloped and mostly inaccessible, although we did see some jet skis. Sunday, a day to relax. 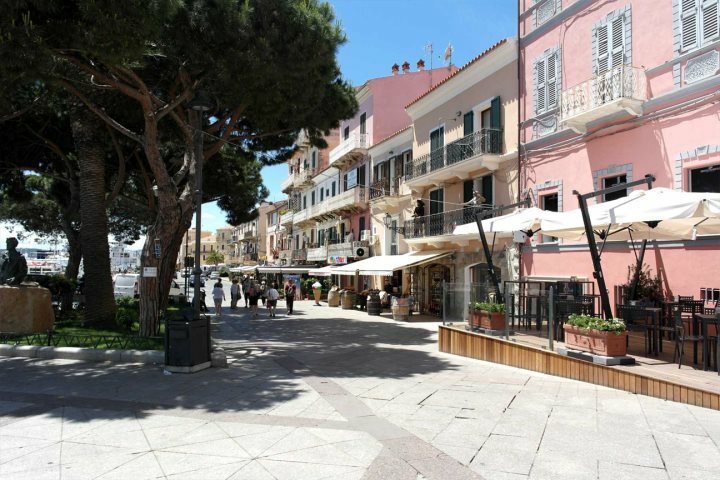 We started with a stroll around the local town, Golfo Aranci, where we found there was more to see than we had realised, with a good selection of shops and some very inviting places to eat. We then headed back towards the hotel, stopping along the way at La Spigola beach café for a light lunch. Our table was set against the beach window, so we could enjoy the lovely view along with the delightful food. Then it was down to the hotel beach to stretch out on sunbeds for a few hours. The water looked inviting but was quite “fresh”. We walked out about 100 metres, where the water was still less than waist deep. It was very safe as beaches go, but not the best place for snorkelling. After changing in the hotel we returned to a bar we had passed earlier in the day, Capitan Joe’s, for some very strong vodka cocktails and more Ichnusa beer. We took up our reps advice to visit La Maddalena. 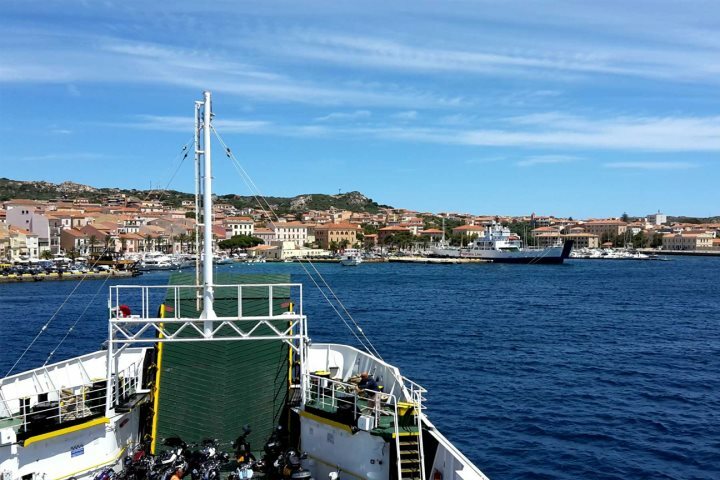 An hour’s drive took us to Palau, where we caught a ferry to La Maddalena, which was €37 return for the car and two passengers, which we thought seemed reasonable. 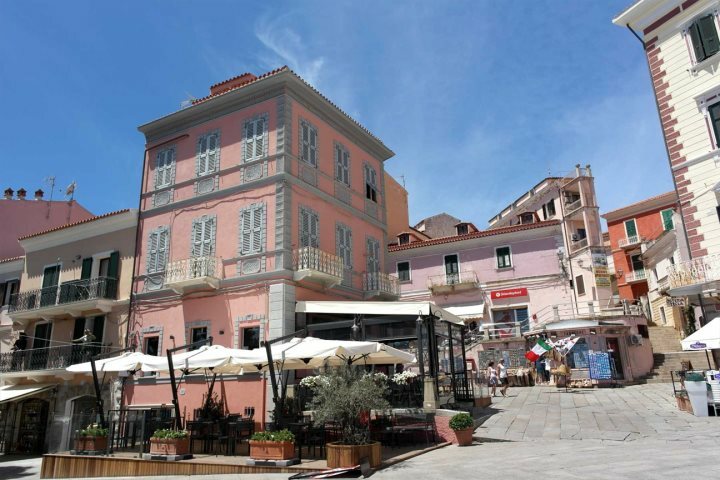 Maddalena itself is such a pretty looking town. The view from the ferry as you approach leaves you itching to get ashore and start exploring. We left the car by the harbour (free parking) and went for a walk-about. The buildings were a colourful mix of oranges and yellows, laid out in higgledy-piggledy fashion, with bougainvillea providing a brilliant splash of intense pink on walls and balconies. We then headed to the adjoining island of La Caprera, where we found an island which appeared completely undeveloped. A few small, temporary-looking bars were tucked in amongst the trees along the road, offering cool seating areas and refreshments. Pretty much by accident we found ourselves at the house of Giuseppe Garibaldi, which although supposedly open to the public at the time was actually closed. 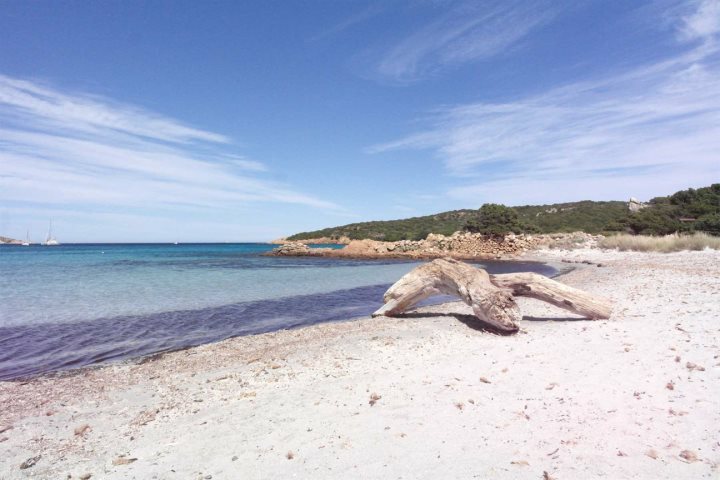 On La Caprera we headed to the beach of Cala Portese. Undeveloped, except for a small rough-ground car park, this is one the nicest beaches we have seen anywhere on our travels. 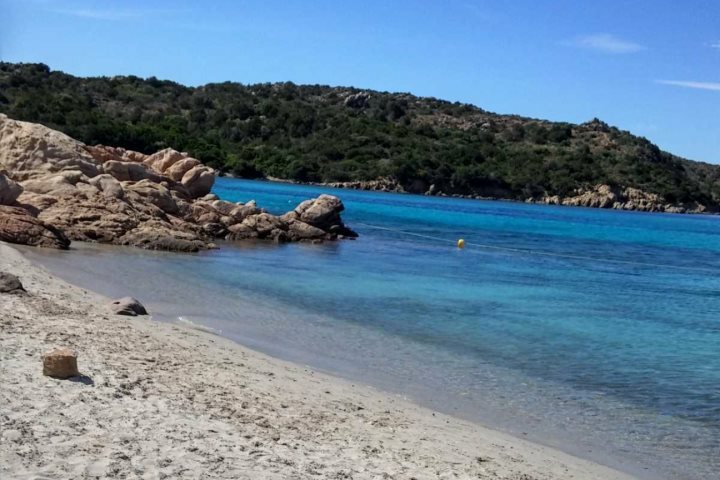 On our final day, we decided to try Cala Brandinchi beach, just south of Olbia. On arrival we found a parking booth where we were given a ticket; the tariff was €3 per hour. Beyond the booth was a sign showing the sandy roads to the beaches, the two ends of Cala Brandinchi and the separate beach of Lu Impostu. We chose the end of Cala Brandinchi which indicated café facilities and headed off about another mile to reach the beach itself. We stayed here for a couple of hours, and on the way out we decided to check out the other end of Cala Brandinchi and Lu Impostu. Lu Impostu we thought was the better beach. Fine light sand and less sea grass, less people but no facilities. We lingered here a while more before leaving to head back to Golfo Aranci. On the way back we made some further stops, just picking side roads at random. The beach at Porto Taverna was nice but we moved on anyway and ended up at Pittulongu. This had another nice beach with a pleasant beach bar where we stopped for drinks and more sunbathing. 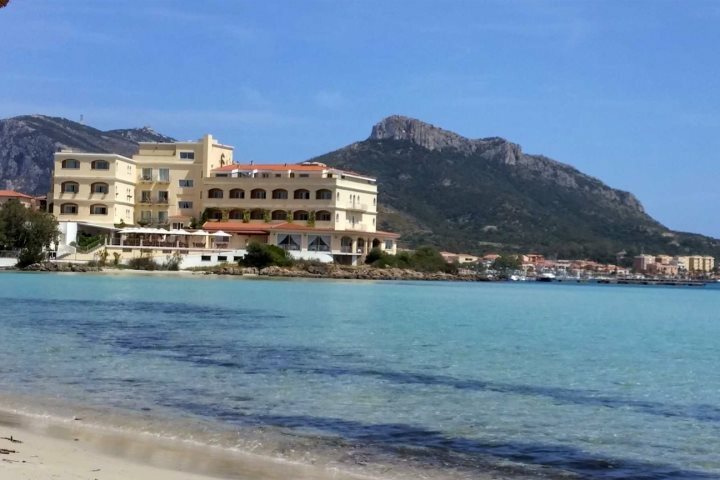 Overall, we found Sardinia absolutely delightful. 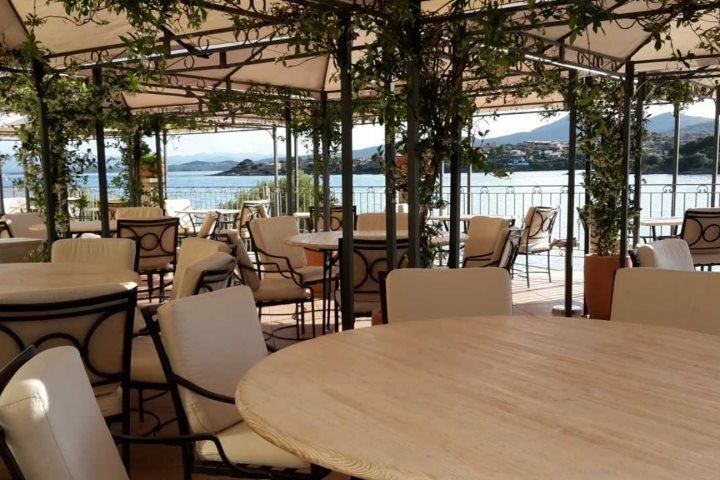 The hotel Gabbiano Azzurro was impeccably clean, our room was spacious and nicely furnished, the food was impressive and the staff were friendly and helpful. The island is pretty and was uncrowded in late May/ early June, and at times we felt we had the roads entirely to ourselves. The places and bars we visited all had their own unique style, whether it be a quirky throwback from the seventies, or a contemporary stylish affair. 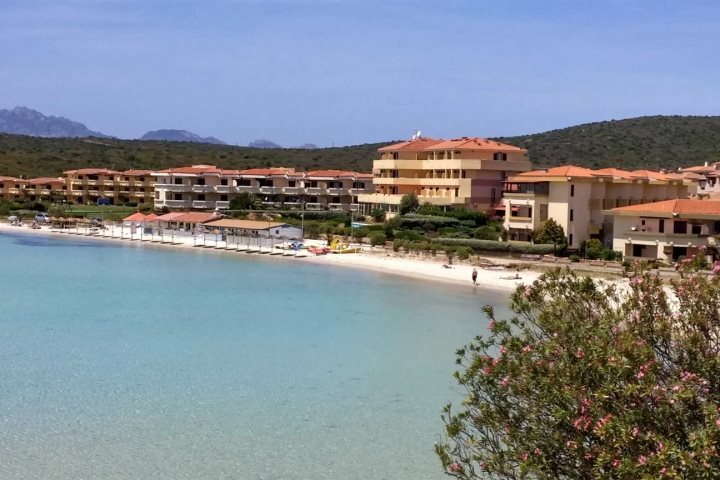 If you’re now tempted by your very own holiday to Sardinia, visit SardinianPlaces.co.uk for more information, and to book.